I drove out to Vernal, UT yesterday and got a very nice tour of Ralph Laub's high tunnel and setup. It was very kind of him to give me a couple of hours of his time to show me not only what he has, but why he has done it the way he has done it. I know he saved me from some trouble on my geothermal system because of some comments he made. Ralph was the same person that turned me onto the NRCS high tunnel program and saved me a couple of thousand dollars. That isn't a small thing, so a big thanks to him. Wish I would have been smart enough to take some pictures yesterday. 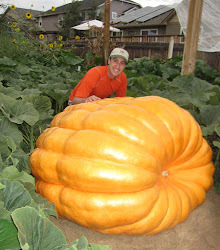 Some Utah growers probably woudn't know it, but Ralph grew the 3rd biggest official pumpkin grown in Utah last year. He took that pumpkin to another state so I'm not sure most people ever saw it. The pollinator on that pumpkin was Matt's big one, so some nice genetics in that seed. Ralph has a nice setup. A greenhouse that is twice as big as the one I'll be growing in this year with some nice enhancements added to it. Sounds like Ralph isn't planning on growing this season and instead is going to be doing a pumpkin tour this summer. I'm sure after that he'll come back with some very nice new ideas for next season. I ordered my high tunnel today. Sounds like it could be arriving by the end of next week. In my own "patch" the 1974 seed seems to be the most aggressive grower so far. Matt told me it was by far the most aggressive plant in his patch this last year, so it will be interesting to see if that continues to hold true for this season.